Marketing your Real Estate services or apartment rentals to attract potential clients is just common sense. An integrated approach to your marketing will make your spend much more lucrative for your business. Integration is one of the many reasons that your business should use signage. With an Integrated approach signs will help in Guiding customers to your open house, conveying the promise of your brand, cut costs & increase profit, drive traffic to your website or social sites and spread the word about your brand. Some of those methods are things like online digital marketing with an ILS or banner ads, TV and Radio Ads, print ads, signage, and social media. While you may not use every medium of advertising for your business, it’s a great idea to review them all, their costs, and how they may benefit your overall marketing strategy. Creating a unified experience for your potential client not only helps to create brand awareness but builds a positive perception of your brand overall. Whether it’s a new monument sign, a yard sign or a vinyl banner, your signs bring all your marketing together into one cohesive brand. A commercial sign company like Custom Sign Center can help with ready-made Real Estate signs that you can customize for your brand. Once your graphics and message are set it’s easy to add more commercial signs with your artwork. We can also help with ground signs, like monument signs for your apartment communities or electric illuminated signs, which are great indoors or out. We can also help with sign repair and maintenance of your monument or electric illuminated signs. These websites give tips and tricks to help you drive traffic to your open houses. Every one of them, that I have visited, recommends signage, and lots of it. Tomferry.com suggests putting out 20 or 30 signs for your open house. Realestatecareermentor.com says to use at least 10 or more. Melissa Lynn, Property Manager for Brookview at Templeton/Citation Club/Noble Park tells me that ‘without signage her open houses would not be possible.’ Not only will you drive traffic to your open house but the traffic you receive may help to fill your pipeline with future buyers/sellers or residents. According to the American Apartment Owners Association 50% or more of visits from potential renters traditionally come from your rental signs. More traffic always leads to more leases/offers. Your ‘Brand’ is your bond. Your brand promise is not what you do, but more who you are and what you’re about. How do you create value for your customers, and how do you deliver that value. The promise of your brand is ingrained in everything you do. From the first phone call down to the handshake at the closing table. Consistency is key. Your signage can help with brand continuity. For apartment communities this entails everything from the road signs, to the community’s monument signs. Jeff French, Director of Sales and Marketing for Ardent Communities, expressed to me that after building a new community, close to 50% of the initial marketing budget is spent on signs. From road signs, building numbers, monument sings, wall signs, yard signs, flags and banners. Wow, that’s a lot of signs. Let your signs promote your brand 24/7! Keeping your overhead down is a must. It’s like the old saying; A penny saved is a penny earned. Sticking to your budget doesn’t have to hurt your bottom line. Signage is one marketing medium that you pay for once and it keeps on working for you for a long time to come. The cost of our yard signs is as low as $3.90 each, plus the cost of the frames and stakes. It’s not like hiring an assistant to go out and pound the pavement to bring in potential customers. Not only is that employee unable to speak to everyone that would see your signs, but a vivid, full color sign can make a more positive impression on your potential clients. In addition, your sign will never be sick or take a vacation. Posted on thedesignfoundation.org is a study aptly named: The Economic Value of On-premise Signage, written by the Economic Center at the University of Cincinnati.3 It states that 76% of consumers said they had entered a store or business they had never visited before based simply on its signs. 3 67% said they had purchased a product or service because the sign caught their eye. 3 This is huge! That’s nearly 8 in 10 people. Xerox released the results of a study that showed “Color increases readers’ attentions spans and recall by 82 %.” When you add photos to backup your points made in your content, retention rates climb even higher.4 Signs.org discusses a survey that states ‘only 1% of first-time customers come in because of your television ad. But 50% come in because of your sign. If you're spending only $0.11 cents per 1,000 exposures to get that 50%, that's a good use of your money.’2 Their survey discussed a double sided pole sign for a car lot, which had 60,000 motorists passing by each day, and estimated the sign would last 7 years, this is where they came up with the $0.11 per exposure. What is your cost per lead? The consensus is, if you want to reduce that cost, buy more signs! Thousands of businesses out there are wondering how to increase the traffic to their websites. This is a common problem with Real Estate Agents as well as Property Managers. Without traffic you don’t get leads. Without leads you don’t make sales. Without sales there is no revenue. This is not a logic fallacy, this is reality. You need unique visitors to your site. Other advertising, like an online ILS, or local printed guide book costs monthly. Some can be pretty pricey. Once you purchase your signage and get your design just right, there is no further cost. Put them out when you need them, and store them away to keep them well preserved when you don’t. They drive traffic to your website 24/7 and never take a day off! Word of mouth (WOM) marketing should be a considered strategy of every business, and signage can be an effective promoter of that, too. What is WOM? Example: I am driving down the road, and I see a cool sign for an apartment community. I loved the sign and remember that my friend is looking for an apartment. Because I saw the sign, and remembered it, I told my friend and she called and put in an application for your rental. Even though I did not need your service, your sign worked for you. 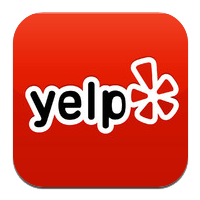 33% of people who see a sign will tell someone else about the service and location. That’s how you spread the word! Additionally thesignagefoundation.org study by the University of Cincinnati also says about 75% of consumers have entered a location because of a sign, and most also indicated that a bad sign or no sign deters them from entering.2 Your sign’s readability is the most important factor when designing your sign. Going back to the Xerox study it’s the color and composition that attract the eye and enhance your benefits. There are many benefits to businesses that use signage to attract customers. I’ve touched on only a few in this short article. With an integrated approach to your marketing you will make your marketing spend work better for you and your business. While you should never rely on only one advertising medium, like signage, remember that 50% of your traffic comes from these quiet marketeers. Use many different types of signage to guide customers to your open house, convey the promise of your brand, lower your costs while increasing revenue, drive traffic to your website and get others to spread the word about your brand. Yard signs, flag signs, ground signs, monument signs, pylon signs, pole signs, flags, and vinyl banners are all inexpensive ways to reach your customer. Use your own style and flair on your signs to show off your brand. 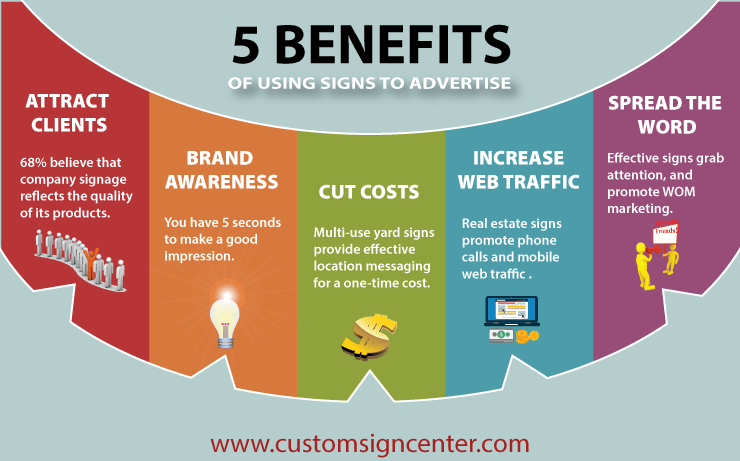 If you enjoy just these five benefits from using signs, you’re now ahead of the game.